INDIANAPOLIS — Indianapolis Metropolitan Police Department detectives are investigating an east side home invasion. 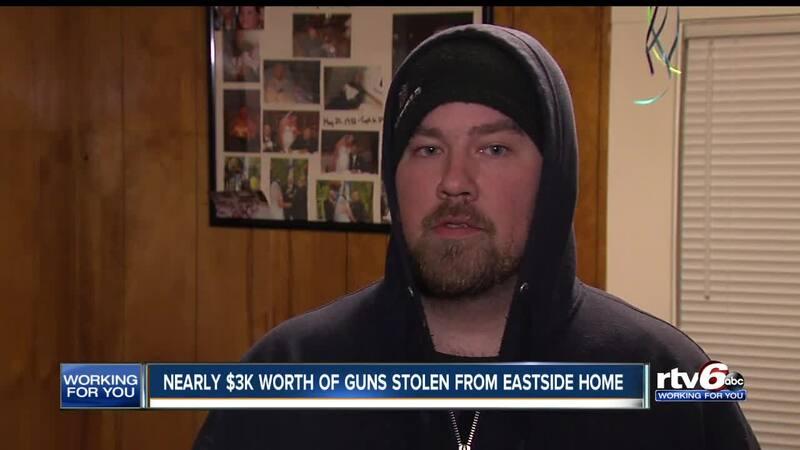 More than $2,500 worth of guns had been stolen from the victims home. The victim, a licensed gun owner, says the guns were locked in a safe. Kyle Patterson says his digital safe was taken apart on Monday when his family was away from home. "Cushions were off the couches, stuff was knocked over," he said. "I walked in and seen my front room with DVDs, and all of my belongings, just thrown about." Patterson says he found his safe wide open and ransacked. All four of his guns gone. The guns stolen were: a Glock 23 ($500), Glock 19 ($600), Saiga AK-47 ($700) and a 5.7 Caliber handgun. "The damage has already been done as far as going through everything personal that you own," Patterson said. He says he is not holding his breath that police will track down the stolen guns. Saying, it's highly unlikely that all four firearms are going to be recovered at the same time, because more than likely they're going to split off to do separate crimes by separate people. Call police to report the theft. Call the ATF's stolen firearms program: 1-888-930-9275. Fill out U.S. Department of Justice stolen firearms form, and mail to ATF's National Tracing Center. The Patterson family says they're working with their landlord to install an alarm system with cameras to better secure their home. IMPD recovered more than three thousand illegally owned guns in 2018.